Mugen Densetsu Takamagahara Dream Saga manga series by Tachikawa Megumi images and info. Part of a diverse shoujo anime, manga, video gaming, and live-action Japanese drama website. 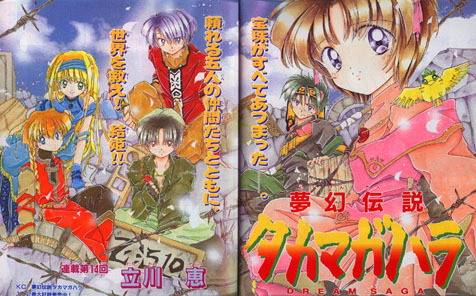 "Mugen Densetsu Takamagahara", also known as "Dream Saga", is a fantasy world action/adventure/romance/drama/comedy manga by Tachikawa Megumi, which ran in the manga magazine Nakayosi. As soon as Yuuki falls asleep she awakes in a strange desert. A group of men approach and call to a Takaomi. Could it be the Takaomi she knows? But the young man who steps forward is much older than her friend. Yuuki is a little disappointed, and then she becomes quite startled and indignant when he tries to kiss her! An emergency brings to light that Yuuki is the legendary girl of this land. Takaomi doesn't believe it. Unknown to Yuuki, what it means is that, along with four others, she must use magical powers to rescue the Sun Goddess, Amaterasu. When Yuuki wakes up the next morning she can't help thinking about the Takaomi in her dream. At school she sees her friend and wonders if he could be the same person. Nachi, the tennis player with a crush on Takaomi, is arguing with Souta, the studious boy in the class, over an upcoming test. In a subsequent Takamagahara dream, Yuuki and Takaomi come across a strangely-dressed person wearing a head covering, only his eyes visible. The man is wearing a necklace with a comma-shaped bead just like Yuuki's, and it starts to glow. When his head covering is pulled back he looks familiar to Yuuki. It's Souta in a different form! Yuuki finds out that her "dreams" are not really dreams at all. When she awakens in the morning, it's as if she hadn't slept at all. Each day she is tired from her dream world escapades. She really is traveling to the land of the gods! In more adventures in Takamagahara she meets up with other forms of some of her other classmates, each discovering they also have a special bead. There is one big difference between her and them, however: in this world they are all older than in the "real" world, but she's the same age in both! By now Yuuki knows she really cares for Takaomi, but his childhood friend, the Princess Kaya, has been kidnapped and they have to search for her. Yuuki is sure Takaomi loves the princess. Yuuki and her friends must find out what the beads are, and what has been happening. The mysterious mark on Takaomi's forehead and the fact that he may be of both worlds is puzzling.... since he isn't one of the magical five, who is he? Mysteries, adventure, fighting action, magical creatures, an evil "father", romance, spells, friendship, and lots of humor make Dream Saga an enjoyable and suspenseful series for everyone! Highly recommended!